Autumn is slowly approaching, with cooler evenings and mornings, but in general it's still been hot. The foliage has changed from green to bronzes and gold, and the young animals are growing up quickly. The volunteers have been very busy with their projects and are doing great work on the reserve. On the 12th of March one group headed out at 6pm to carry out some evening hide observation at Ma Matumi hide. In the evening different animals are active compared to during the day so it's possible to see predators as well as the usual elephants, kudus and impala. Everyone had dinner watching the sunset and then we heard a hyena call. 5 minutes later 2 hyenas were swimming in the waterhole just in front of the hide! We watched them for 20 minutes and managed to record their calls; it was a great experience. During March we have been concentrating on removing old wire fences from the boundaries of the reserve. Coiling the wire up and taking it away from the road sides is important so as to stop the possible poachers from making snares from the wire, as well as preventing accidental animal injuries. So far this year there hasn't been as much rain as was expected and the animals are beginning to struggle to find water to drink - we're worried about the baby Impalas; fingers crossed for more rain soon! The volunteers can help by keeping the water sources in Kwa Tuli reserve clean, and by digging the waterholes deeper. This might be a muddy job but it's quite good fun to get your feet dirty! When we move to the new camp in the north we plan to build a number of new waterholes in the area in order to provide the animals with more to drink. Bird Observation... and a surprise! One ordinary afternoon, 6 volunteers set off for an hour of bird observation by the river. Apart from seeing a whole group of Maribou storks and rare Goliath heron, they came across a HUGE breeding herd of elephants! On foot it is such an experience to be so close to these amazing animals. 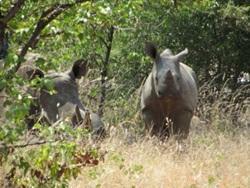 9 volunteers set off at 4.30am, on a mission to see some Rhinos at the local reserve, Limpopo Lepardi. Mission accomplished! They also saw lots of giraffes, kudus, wildebeest and quite unusually a red hartebeest! A fantastic day out was had by all. 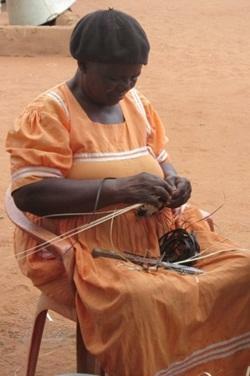 On the 29th March a group went to Mathatane, the local village, to meet Mma Rosina. She is the grandmother of Sakaeo, our project supervisor and she had offered to teach volunteers some local crafts. Everyone learnt how to make mats and bracelets from Ilala palms and helped to cut the materials from the trees and crush the bark to make different coloured dyes. It was lovely to sit with the local women and we will definitely be making frequent visits to learn more of her craft skills. Visit from a famous bushman! In the last week of March we were lucky to be visited by Lloyd Wilmot, a friend of Helena and Judi who own Kwa Tuli Reserve. Lloyd grew up in the bush and has hundreds of fascinating stories about close encounters with animals. He now runs photographic safaris in the Delta and told us how he gets up close to the animals to get a good shot!